If you will take 3 - 5 minutes out of your life and do me & yourself one favor right this very second and read this entire page, I guarantee this article has the potential to CHANGE YOUR LIFE!!! As many of you know, I'm all about moving forward and preparing yourself to be successful. AND as many of you know, I often provide you with the tools or "thought provoking" strategies to take that next step on the road to a successful career. Now, that being said, it really amazes me sometimes how often I hear from people about the obstacles they face when thinking about a new direction or plan for their surgical tech career. I mean, its not that "obstacles" people face are a surprise (such is life), rather I'm simply amazed how often I hear about the multitude of reasons that may prevent somebody from moving forward or the obstacles they think about which ultimately prevents them from taking action. Listen, if you've been THINKING about ways to advance your current surgical career, or even life situation for that matter, I have one of the EASIEST ways for you to succeed no matter what you are thinking about doing. This one little tiny technique will CATAPULT you into new opportunities and open up doors that suddenly seem to have "just happened". If you follow this little tiny bit of advice that has been proven to work for the most successful surgical techs, RN's, FA's, PA's, MD's, Educators, Students, etc, I GUARANTEE things will start to happen in your life that suddenly seem "ironic". I want YOU to succeed & in order to succeed BIG you must THINK BIG! Why think any other way? Let me explain with an example or two that may help you understand where I'm coming from. 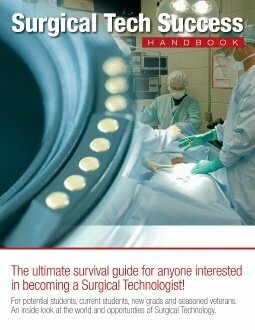 I speak to surgical techs on all levels on a regular basis about the field of surgical technology and ways to advance a surgical tech career. And during these conversations, whether on the phone, via email, or in response to one of my news letters, I inevitably receive a negative comment or two about the things that are preventing them from moving forward. It really is amazing how people just don't think about thinking BIG! I get responses on a daily basis from potential surgical tech students who want to get into this field but they just don't have the finances for tuition. While this is completely understandable, why not think BIG and know that the student loan, grant, or scholarship will come through, OR the surgical tech school will be open to making payment arrangements with you. It is possible! It is happening! AND it can be done! I also get responses from surgical tech veterans who've been in the field for some time and they have nothing but negative things to say about being a surgical tech because they've worked the last 10 years at $? ?-bucks an hour and they hate what they are doing. AGAIN, why not THINK BIG & go back to school, or travel, or get into sales, or do some agency work, or teach, or change services, facilities, states, etc. I also get responses on a daily basis from individuals about why they can't pursue first assistant training. And it seems that one of the most common & understandable responses I get is: "My facility does not recognize or employ first assistants". Why should you be restricted to that one facility? Why not find a surgeon or a group of surgeons who might be willing to hire you as a first assistant and bill for your services. I speak from the heart & believe me I've been there. I've spent irreplaceable times in my life thinking small and getting small results in return. STOP limiting yourself to only what you see right in front of your face!!! It's so easy to get caught up in small thinking and never realize your fullest potential. Do you really think there is one person on this planet God has destined for failure? We ALL, and I mean you, me, your co-workers, classmates, educators, friends, family members, bosses, etc, have the potential to achieve greatness in our lives!!! We just have to believe, take action, & THINK BIG! Maybe that greatness comes from becoming a surgical first assistant, or surgical PA, or RNFA, or Surgeon, or hospital administrator, etc. Wherever YOUR greatness leads to, it all comes from what we were blessed with and that is the ability to THINK BIG and blossom into the best that we can be. Sooo, today, right this very second, I challenge you to stop looking at the reasons why you can't do something & start thinking BIG about the ways you will accomplish your goals & dreams. As I've said before, life is not a practice run! So why waste a single second of your life thinking small. Think BIG and BIG things will happen! We simply cannot prepare for defeat & expect to have victory! Get up, get moving, and don't stop. The world is a buffet of opportunities! Prepare your mind, Think BIG, believe in yourself, and take action.